It's been a busy month for the gaming world. With Caesars and 888 and the Wynn and PokerStars announcing major deals, Full Tilt didn't want to be left out. It went public last week with news of its partnership with the family behind Station Casinos and the UFC. The Sands wishes its press releases were about future partnerships. Instead, all of the buzz about the Sands these days is about various investigations of corruption. When anyone tries to sue or investigate CEO Sheldon Adelson, fireworks are sure to go off. 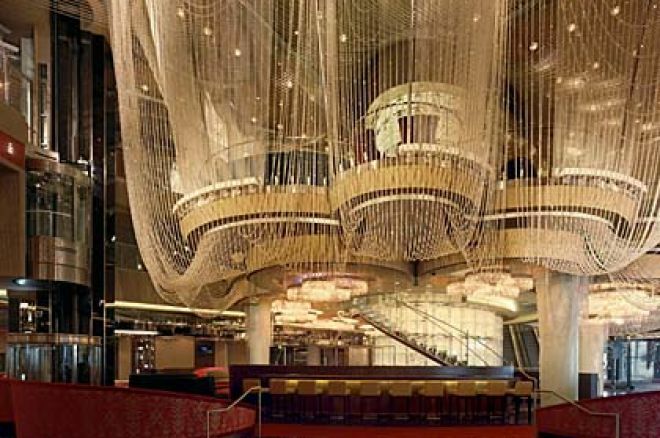 And in even stranger news, the Cosmopolitan announced a loss of nearly $140 million during the 17 days it was open in 2010 but is pleased with the hotel-casino's prospects. We don't make it up. We just report it. The last few weeks have been like a Law and Order episode for the Las Vegas Sands Corp. First, its subsidiary, Sands China Ltd., failed to derail a wrongful termination suit. Then Sands China announced in its annual report that the company was being investigated by the U.S. Securities and Exchange Commission, the Justice Department, the Gaming Control Board, and the FBI for alleged violations of the Foreign Corrupt Practices Act, which prevents American companies from bribing foreign government officials. And a few days later, Sands China added that it is also under investigation by the Hong Kong Securities and Futures Commission. Both Las Vegas Sands and Sands China stocks have taken hits with each announcement. Sands China's former CEO, Steven Jacobs, was fired last year and sued the company for wrongful termination in October in the Nevada court system. Sands founder and CEO Sheldon Adelson tried to have the suit thrown out, saying it could only be properly adjudicated in Macau. Jacobs responded with a filing full of what he promised were drama bombs that would interest Nevada regulators in keeping the suit on home turf. Adelson's motion failed, and he wound up with a line of investigators out the door. A judge-mandated settlement conference is scheduled for later this month. "I'm not optimistic there'll be a settlement, but we'll go through the motions," Adelson said. He has called Jacobs' suit "pure threatening, blackmailing and extortion." Adelson is putting on the standard "I'm not worried" show for the press. "When the smoke clears, I am absolutely, not 100 percent, but 1,000 percent positive that there won't be any fire below it," he said at an investment conference last week. Perhaps Adelson's Luddite ways will work in his favor. He said the departments investigating the Sands wanted to read all of his e-mails, but "I don't have a computer. And I don't use e-mails, I'm not an e-mail type of person." He also said he expects the investigation to take four to six months. He is known for his love of litigation, but his shareholders are no slouches in that department either. Sands shareholders responded to the news of the investigations with a lawsuit of their own, claiming that Adelson, COO Michael Leven, and other directors exposed the company to unnecessary expensive investigations. The suit, filed in Las Vegas federal court on behalf of four shareholders, is attempting to force the company's directors to sue themselves to recover losses. The Sands is still fighting two other shareholder lawsuits filed in 2010 over the precipitous drop in stock prices during the economic crash. Sands stock was as high as $144 per share in 2007 and fell to $2 by 2009. It is back up to the mid $40s, based largely on strong returns from its properties in Macau. We'll keep you posted on the latest Sands drama as it develops. In the meantime, you can read about the investigations and its effect on Sands stock in Bloomberg and get more details on the shareholder lawsuits from the Las Vegas Sun. Full Tilt Poker added its name to the list of major online poker sites announcing partnerships with brick-and-mortar casino operators. Last week, Full Tilt made public its deal with the Station Casinos family to co-operate a poker site if Internet gaming is legalized in the U.S. A week earlier, PokerStars and Wynn Resorts Ltd. announced a similar partnership, and Nevada gaming regulators approved a separate deal between Caesars Entertainment Inc. and 888 Holdings, LLC. Full Tilt is joining forces with Fertitta Interactive, a company co-owned by Tom Breitling and brothers Frank Fertitta III and Lorenzo Fertitta, part owners and operators of Station Casinos. The brothers are also majority owners of Ultimate Fighting Championship (UFC). Full Tilt already has a relationship with the UFC. Unlike the deal between PokerStars and the Wynn, Full Tilt said it would not tie a site to the Station Casinos brand. There is plenty of speculation, however, about potential UFC branding opportunities. "Our arrangement with Full Tilt is confidential but it is contingent on the passage of federal legislation regulating Internet poker," Breitling said. Both companies are against the Nevada assembly bill being advocated by PokerStars that would legalize and regulate online poker at the state level. Read more about the partnership in the Las Vegas Review-Journal. The new Cosmopolitan of Las Vegas was only open for 17 days in 2010, but that was long enough for the $3.9 billion (with a B) resort to report a loss of $139.5 million. That's $8.2 million a day or about a third of a million per hour. Kinda makes you feel better about your hourly, huh? Cosmopolitan execs aren't upset though. They say the the negative numbers are due to pre-opening expenses that won't be incurred in the future. But their amazing hotel revenues also aren't likely to last. In its first 17 days, the Cosmopolitan's 1,998 hotel rooms were 97.8 percent full and brought in an enormous average rate of $319. The casino's gaming revenue, however, was small compared to its overall take. Despite the December losses, the Las Vegas Strip's newest hotel-casino is on track to be profitable, according to Deutsche Bank, which has a controlling stake in the casino. In the report, Deutsche Bank said that based on market data, gaming industry trends, and the overall economic climate, it does not anticipate the need to write down the value of the property again. "Based on these projections, management believes the cash flows from the property are sufficient for the company to recover its investment in the Cosmopolitian," the report said. The company wrote down its investment by $756 million in 2009 and 2010. Read what Deutsche Bank has to say in the Las Vegas Sun, and get the perspectives of slightly less-biased analysts in this CasinoCity Times article.